LG Pay, which is LG Electronics’ mobile payment service, is going to be released in September as a form of ‘All-in-One Card’ that will become the world’s first mobile payment with IC (Integrated Circuit) Chip. It will be the only mobile payment with IC out of 20 platforms that are currently released. LG Electronics is challenging SamsungPay that is based on MS and ApplePay that is based on NFC with ‘IC transaction linkage’, which will be very versatile. Before releasing LG Pay with IC Chip, LG Electronics signed off on a MOU with KB Bank on the 19th regarding cooperation in White Card business. This action was taken to implement world’s first payment platform with IC Chip through KB Bank. Actual White Card will be able to expand strong infrastructures as it interconnects with IC Card conversion business that is being ran by South Korean Government. It can be sequentially introduced to even MS-based stores that are occupied by SamsungPay already. As MST transaction method is going to be gone in markets starting from 2018, LG Pay rise as a platform that allows every transactions. Because there is a high chance that IC Chip transaction will become the main platform of financial companies, LG Pay can also hold superiority in competition against SamsungPay. Through cooperation with KB Bank, LG Pay will be connected to current financial products and develop variety of financial services such as new businesses and others. First of all, cash withdrawals and deposits through bank ATMs will be possible through LG Pay. Not only withdrawals and deposits from bank accounts, inquiry, transfer, and wire transfer will be possible through cash dispensers, but they will also be possible through ATMs and other banks’ cash dispensers and ATMs. Purchase of goods will also be possible at stores that support cash cards. LG Pay will absorb all of infrastructures of instant-paying cards that are currently competing against check cards. Along with cooperation with KB Bank, LG Electronics already started working on linking LG Pay with Shinhan Card and KB Card. It is heard that LG Electronics recently made partnership with major card companies such as Lotte Card, Hana Card, BC Card, NH Card and others. Smart OTP (One-Time Password) will be set up in a White Card as a basic function. Smart OTP is a technology that causes OTP , which can only be used once during an electronic financial transaction, by using a Smart device. Until now, bank customers had to prepare OTP modules separately and possess them. LG Pay eliminates this kind of inconvenience by storing Smart OTP and it will even replace OTP Cards. LG Pay will also solve security problem, which is considered as the most sensitive problem for consumers, by having IC Chip and Smart OTP. It can block any illegal uses from the start and is one step towards EMV standards, which are standards for IC transactions. EMV is the international standards for IC Cards and terminals that were co-established by 3 international credit card companies such as Visa, MasterCard and other in 1996. LG Electronics requested a Smart Card manufacturer to make White Card, and this manufacturer is currently in a process of building lines that can manufacturer White Cards. Although schedule is postponed due to improvement in process, it is expected that White Card will be released in September. 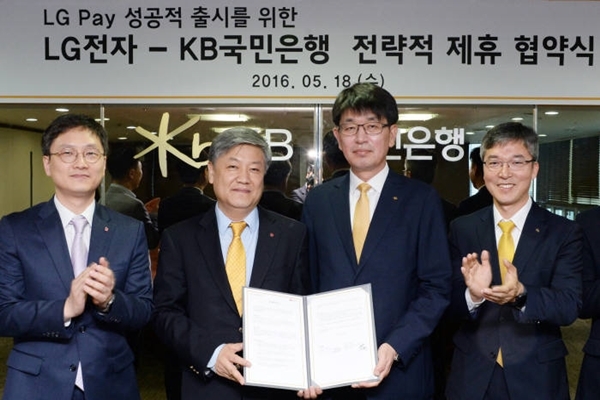 “I predict that a new financial service will be provided by combining KB Bank’s rich experience in Fintech business and LG Electronics’ technical skills in mobile devices.” said Department Head Kang Dae-myung of KB Bank’s Future Channel Group Headquarters.